A young Huddersfield hairdresser has snipped his way to success after coming top in a national hairdressing contest. Reef Healey, 16, an apprentice at Gary Pearce Men’s Hair in Wakefield Road, waterloo, proved himself a cut above after he was named overall junior men’s champion in the Welsh Open Hairdressing Championships. The talented youngster, who lives in Scholes, wowed judges after competing against the clock with 19 other hopefuls at Cardiff City Football Stadium. 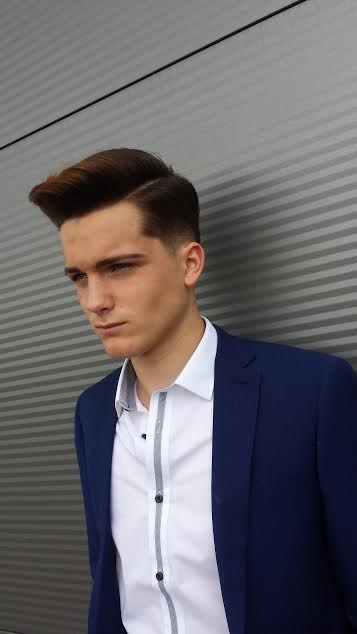 He also came first in the junior men’s blow dry and second in the cut and finish sections, following his sleek re-style of model Harry Jenkinson’s locks. It is the latest accolade for Reef, 16, who, despite only being a hairdresser for eight months, also came second at a contest in Blackpool in March. Reef said: “To come top is absolutely fantastic, especially as I’ve not been hairdressing for that long. He had 20 minutes to blow dry the model’s hair and another 30 minutes to perform a cut and finish. Harry Jenkinson models Reef Healey's hair style at the Welsh Open Hairdressing Championships. Reef said: “I was very nervous on the day and it was tough to compete under such tight time restrictions but preparation before helped a lot. Reef now hopes to use his success as a springboard to winning even more awards. He added: “I’d always been interested in hair and fashion so hairdressing was just something I wanted to have a go at and I got offered an apprenticeship at the salon straight from school.